This tour will take you first through a Lisbon of contrasts and then prompt you to a selection of fairy tale and mythical locations. 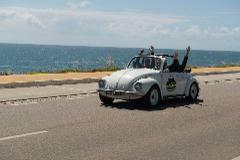 We’ll take you through the Lisbon city centre, Sintra, Cascais, Estoril and along the riverside area. 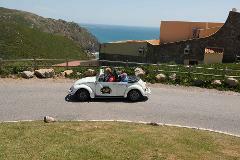 Take a 6-hour tour in a convertible Beetle that begins with a morning drive to Sintra, passing through scenic landscapes with scheduled stops to experience a selection of Portuguese traditional flavors. In Portugal we are great producers and wine lovers. This tour was created to make you fall apart with new flavors and grape varieties. Tasting of regional products, from wines to pastry and with a beautiful landscape as scenario.